One of the most promising nanotechnologies which can replace the present transistor based CMOS technology is the Quantum-Dot Cellular Automata. The major advantages of this technology are lesser power dissipation, improved speed and dense structures. Currently all logic gates are based on CMOS technology. With the current pace of scaling CMOS technology is set to hit a roadblock in the next few years, where it cannot be further scaled down due to several reasons like tunnel currents, quantum effects, subthreshold leakage, short channel effects, fabrication costs and interconnect delay etc. Logic Design with Quantum Dots is one of the most recent technologies being researched which allows scaling to continue to atomistic dimensions. In this particular logic design approach Quantum Cells are arranged in particular fashion to define the logic. Each Quantum Cell consists of 4 Quantum Dots. Owing to electron repulsion and Coulomb blockade electrons are aligned automatically such that the energy of the system is minimum. Quantum-dot cellular automata (QCA) is based on field coupled computing. States of a cell change due to mutual interactions of either electrostatic or magnetic fields. 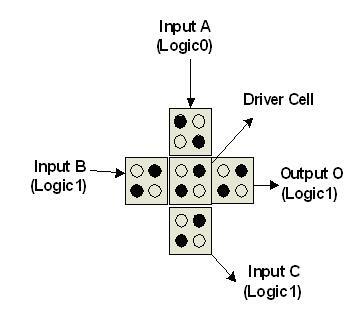 QCA Cell is the fundamental component of QCA Logic. Each QCA cell is made of four quantum dots in which two mobile electrons can be trapped which can tunnel between the dots. Due to the repulsion between the electrons, two electrons always take up the diagonal positions. Binary levels are represented by the positions of the electrons inside the cell unlike the voltage or current levels as in the CMOS. Figure 1 show the structures of quantum cell with two different polarizations (electrons are shown with black filled circular dots). Majority gate and Inverter are the two basic logic devices of QCA. Fig.2 shows the structure of the majority gate with 3 inputs, driver cell and output cell. Computation starts by driving the driver cell to the lowest energy state. Input cell changes its state by the signal which arrives towards the driver cell. Driver cell always gets the binary value of majority of input signals since it is where the repulsion for the mobile electrons in driver cell is at minimum and output follows the state of driver cell. The logic function for the majority gate is given by M(a,b,c) = ab+bc+ca with a, b, c as boolean variables. In this way two input AND, OR gates can be designed by keeping the third variable as either 0 or 1 respectively. Inverter is the other basic logic device of QCA. If cells are placed diagonally to each other then they will have opposite polarizations. QCA Inverter is designed by this characteristic, such as shown in Fig. 3. In the case of QCA, the clock signal modulates the inter dot barrier. QCA designs rely on a set of 4 clocks, phase shifted with respect to each other. Clock is used to .push. information from inputs to the output by modifying the cell tunneling energy.QCA circuits have a four phase clock as against the CMOS which has only two states high and low and all the four phases have a phase shift of 90°, as shown in Fig. 4. Power to the QCA circuit comes from the clock itself unlike external power supply in case of CMOS. To assign the clock, the QCA circuit is divided into four sub arrays and a single potential modulates the inter-dot barriers in all the cells present in given array. Clock feature allows the sub array to perform a certain calculation at which it does not have influence from its successor and it acts as input to the next sub array, adding the feature of pipelining. The four phases of clock correspond to switch, hold, release, and relax. In Switch phase, the barriers are raised and the QCA cells become polarized according to the state of input drivers. In the Hold phase, the barriers are kept high so that the cells in that sub array retain their values. During the Release phase, the barriers are lowered and the cells are allowed to relax to unpolarised state. In the final relax phase the barriers kept on low and the cells remains unpolarised. Unlike computation mechanisms that involve the transfer of electrons, as in CMOS gates, QCA computation does not involve electron transfer between adjacent QCA cells. Hence power dissipation is very less in circuits designed with QCA cells. Since only few electrons are involved in QCA computations, it is susceptible to thermal issues. Therefore it is important to consider power as an important parameter during the QCA design process. The power loss in clocked QCA circuits are classified as switching power and leakage power. Leakage power loss is independent of input states and occurs when the clock energy is raised or lowered to polarize or depolarize a cell. Switching power dependents on input data and occurs when the cell changes the state. Total power loss can be controlled by varying the rate of change of transitions in the clocking function.